There are still a lot of buttons and knobs inside a car, but these are gradually disappearing giving way to touch displays. Mechanical dashboards have already been replaced by digital ones in new car models, and bigger areas of the car interior are being occupied by displays providing useful driver information and passengers’ entertainment. The car interior has evolved significantly over the years, but the most exciting changes are still to come. 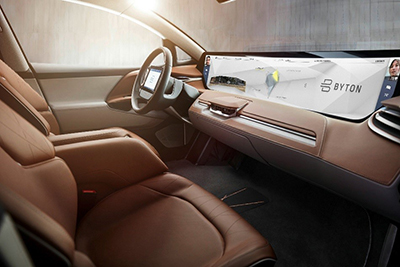 Large area displays are set to be one of the most novel and impressive features in next generation cars. A recent article in Display Daily talks about the “advent of full dashboards”. Citing IHS Markit research, the author refers to the idea of moving away from a series of smaller single function displays and giving way to full display dashboards, which will be common in next-generation vehicles. Eventually, in fully autonomous vehicles, every surface in the car can become a display delivering entertainment and personalised experience. The trend for large area in-vehicle displays was evident at CES 2018, where visionary companies were showing off their car concepts. Byton’s smart car was much talked about. It has a dashboard display which, according to the Verge, is 49 inches wide and almost 10 inches tall. Byton has gone even further by putting a touchscreen tablet interface in the centre of the car’s steering wheel. Electronics company Harman showed a concept dashboard and centre console with OLED and QLED screens from Samsung. CNET reported that the company “leverages flexible screens and connectivity to create an experience much more helpful to the average driver”. Mercedes-Benz also used CES to launch its Mercedes-Benz User Experience (MBUX) infotainment system. 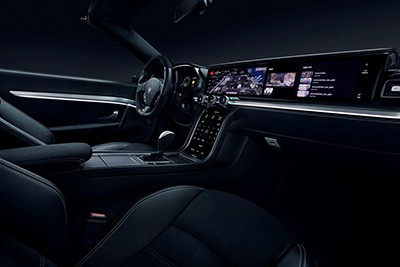 It comprises two wide screens: one for the instrument cluster and one for infotainment. In its review of the car, CNET reports that the widescreen displays are available in three different configurations: two 7-inch displays, two 10.25-inch displays and a mid-tier offering with one screen of each size. Other examples from CES 2018 include Kia’s level 4 autonomous vehicle featuring interactive displays as well as Bosh’s concept car with a large screen centre console. At the International Auto Show in Detroit, which took place after CES, large screens were pretty much the norm in many next generation car models. One of the best examples is probably the Nissan Xmotion SUV, which “is more screen than a car” as described by the Verge. It has three main displays, as well as left- and right-end displays that span the width of the instrument panel. Infinity showed its Q Inspiration concept car which also features a full dashboard display. As displays increase in size, their integration into the car interior, where almost every surface is curved, becomes a challenge. Active-matrix LCDs using amorphous silicon (a-Si) thin-film transistors (TFTs) on glass are being used very successfully in the automotive industry today, however the glass is a very severe limitation when it comes to conforming and shaping. 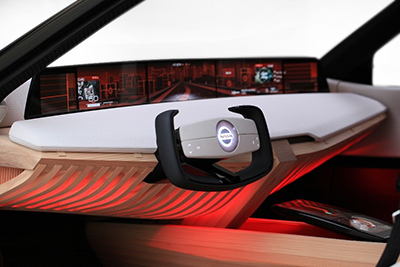 The preferred vision of product designers is to wrap and shape displays to the curved surfaces and spaces within the car interior to enable a holistic design. This vision is now made possible with organic LCD (OLCD) technology developed by FlexEnable. It combines an organic TFT (OTFT) backplane with flexible LCD frontplane. With a bend radius that can go down to 10 millimetres, OLCD is thin, light and scalable to large sizes. Of course, there are other flexible technologies such as OLED. Plastic OLED displays are very thin and have excellent black state, but are currently less well suited for vehicle environment because the display requires a long lifetime at high brightness in a harsh environment. OLCD, on the other hand, uses processes and materials already qualified for automotive applications. OLCD also has the advantage that it shares a very similar cost base to conventional glass-based LCD which puts it at a much lower cost point than plastic OLED. Also, the high brightness of automotive applications can be met by using a brighter backlight (a separate light source) with no impact on display lifetime. In contrast, OLED lifetime decreases rapidly with increased brightness. FlexEnable and Truly Semiconductors, a major supplier of displays to Tier 1s, are working together to bring OLCD into mass production in 2018. We are also working with OEMs and Tier 1s to provide OLCD prototypes for the next generation car models. If you are looking for a flexible display solution, get in touch with us at info@flexenable.com.